Ever Given Thought to the Wiring for your Speakers? When installing the electrical network in our home, switches, lights and power sockets are the main things we think about. However, a modern home electrical installation consists of other networks as well, such as those for LAN, television and telephony. Speaker wiring is often overlooked—with all the attendant consequences. Let’s take a look at some points to consider. If speaker wiring has not already been provided, this presents us with a problem when moving into our home. Since we want to be able to listen to music and the radio, speakers will need to be installed with the result that wires have to be run over the floor along the wall. This obviously doesn’t look very nice in a new or renovated home. If we place the speakers on the wall opposite of the location of the amplifier, we sometimes hide the wires underneath the carpet. The carpet is then visibly and tangibly uneven in places, increasing the risk of stumbling or falling. In most cases, passive speakers are used in homes. These are connected to the speaker outputs of an amplifier by means of a flexible twin-lead wire (two insulated conductors) and usually have an impedance rating of either 4 or 8 ohms. The separate amplifier sends the electrical audio signals through the wire to the speakers. In certain cases, use is made of active speakers, which are equipped with a built-in amplifier. Active speakers must be connected to a power source, which is usually a power socket near the speaker. These are sometimes equipped with Bluetooth or a docking station so that they can be driven directly by a device such as a smartphone. In other cases, a Line-In jack is provided for connecting a CD player or a tuner. In addition to free-standing speakers that can be placed on the floor, on a cabinet, on their own stand or mounted on the wall, there are also many types of built-in speakers. The latter can be installed either in the wall (including hollow walls) or in the ceiling. The main advantage of built-in models is that they save space: they never get in your way, and the wiring is always invisible. Outdoor speakers are also available for use on a patio or in the garden. Here, you will need to ensure that you don’t disturb your neighbours with your favourite music. Speakers come in all sorts of styles, shapes, sizes and finishes. High-frequency sounds are the only ones which are directionally perceptible to the human ear. This is why the precise placement of a subwoofer for low frequencies is less important. Other speakers should be pointed in the direction of the position where we intend to listen to the music. The advantage of surface-mounted wall speakers is that they can usually be tilted in the direction of our listening location via a mounting base. With in-wall speakers, we also have to take the furniture into consideration when planning the space. For example, placing a tall cabinet in front of a speaker is not a very good idea. Ceiling speakers avoid this problem. These speakers direct the sound downward, which nevertheless reduces the coverage area for high quality audio. In-wall speakers and free-standing models cover a larger area. Each passive speaker is connected to its output on the amplifier by means of two copper wires. A red and a black terminal is standard for each output on the back of the amplifier. You will also find these same colours on the speaker connectors. 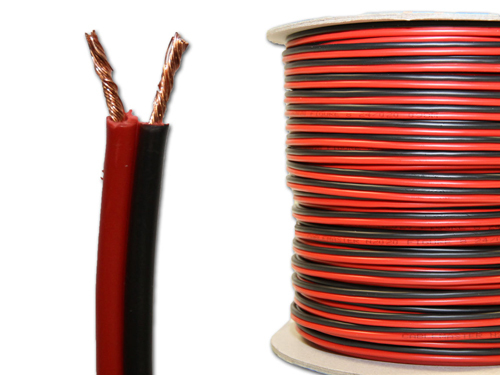 There is special speaker wire available on the market to ensure the proper connection of black to black and red to red. These flexible wires have two separate insulated conductors, one black and the other red. The gauge of the wire, and more specifically of the conductor, is also important. Often, wires that are far too thin are used, which results in loss of signal and poor sound fidelity. The standard recommendation is to use wires with a conductive surface area of 2.5 mm² (for a maximum of 50 m in length). Connectors with gold contacts are only used in certain high-end audio systems in order to maximise signal transfer. However, there is no agreement among manufacturers that this actually yields a difference that is audible to the listener. For standard home applications and for the majority of people who do not have ultra-sensitive hearing, the standard and far less expensive contacts should suffice. Typical speaker wire consisting of one black and one red wire. Is stereo always necessary? In rooms having a fixed location for listening to music, stereo is indeed important. Yet in rooms like the kitchen, where people are always moving about, there is no fixed location for listening and in this case it makes more sense to opt for a less complex mono connection. If you want to enjoy surround sound when watching movies, you will have to make room for several speakers. Besides a subwoofer, front speaker and two side speakers, you will also need to provide connections for two speakers to the rear of your listening location.